I'm so happy to have found this for you! I literally went on a worldwide search. All natural wood flooring adds interest to your home with its high quality & authenticity. Parquet wood flooring is wood, contrasting in color &/or grain, glued down as flooring. 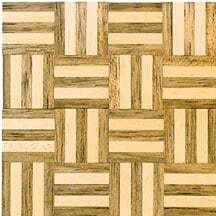 This listing is for 72 square inches of authentic wood Inlaid Parquet, a classic pattern. Parquet was introduced at Versailles in 1684 to replace the marble flooring that required constant washing, which tended to rot the joists beneath the floors. Parquet flooring is most often used in bedrooms & hallways. Each sheet is 2" x 6". There are 6 sheets per order. Covers 72 square inches.